This morning on Today, Al Roker was about to do the weather when he took a detour and introduced a woman who works at a non-profit. Simone Jhingoor was prepared to talk about the Women's Housing and Economic Development Corporation — which sounds great and important — when suddenly, her boyfriend, Chirag Shah, showed up with a rather self-centered ("I moved, MY dream") over-rehearsed speech that turned into a marriage proposal. Bait and switch, dude. As Simone realized what was happening, she tried to fix her hair. She had a tight-lipped smile on her face, but she seemed slightly annoyed. Still, Chirag got on one knee and Simone "yes." Their friends were behind her, cheering. There was a stiff hug. But immediately afterwards, when Al asked if she had any idea Chirag was about to propose, Simone said, "No! I thought I was here talking about my organization. I'm giving back to the community!" Right. You thought it was your moment — you were excited for your moment — and he made it all about him. And Chirag told Al that he and Simone had rehearsed what she'd say in her non-profit-promoting interview, which she never got to do. Post-proposal, the body language between the newly-engaged couple was not good; they were standing pretty far apart from each other. Anyway. 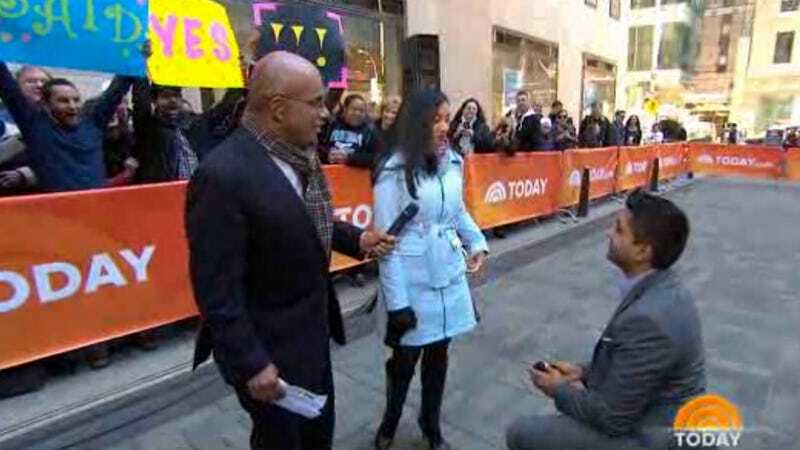 Every little girl dreams of having Al Roker share an intimate moment like that. Good luck, guys.